Thanks for your great question! Let’s first start by reassuring you that nobody is forcing you to use anything that you (or your pupils) don’t want to use. The DVSA’s Standards Check is intended to assess your ability to instruct and whether that instruction helps your pupil to learn in an effective way. A reflective log is simply one ‘tool’ you can use to encourage your pupil to reflect on their own learning and progress, and plan for their way forward. So what exactly is a ‘reflective log’? Essentially, a reflective log is a record of the pupil’s learning experiences, thoughts, feelings and reflections. It should be thought of as a critical assessment of how the pupil is progressing. In using the word ‘critical’, this should not be thought of as a negative assessment – quite the contrary. It should be seen as an honest and positively-framed appraisal of what things are going well, where improvements can be made and a plan for moving forward (the next steps). Reflective logs (or journals) are nothing new – they have been used very successfully for many years in other educational establishments, including some primary and secondary schools. Therefore, it’s quite possible that your pupils will be very familiar with the process, even if it might feel alien to you. Why is it a good idea for us to use them with our learners? This enabled me to keep a track of not just what we covered and when, but specifically how well my pupils carried out those tasks and where they needed to improve. Together, we would then plan what to cover next lesson (although admittedly I frequently ‘led’ the pupil with this decision). I later replaced this ‘Lesson Record’ with a ‘Reflective Log’ (see below). It’s essentially the same format but now phrased with more client-oriented wordings, and with space for the pupil to add in what steps they can take to improve between this session and the next. This may be something as simple as reading a handout or a section of the Highway Code, watching a particular training video or observing another driver’s handling of a skill (such as dealing with roundabouts). Or they may record detail on what specifically they will focus on during private practise with a friend or relative. The new reflective log also enables the pupil (or me) to note down anything else of relevance, e.g. ‘advised to put test back a couple of weeks’ or ‘block booking payment due next week’. From a learning perspective, keeping a reflective log will help your learner take more responsibility for the direction and content of lessons. It can also improve ‘flow’ throughout their course of lessons. As they become accustomed to using a log, you may find they progress quicker as they practise the skill of self-reflection. As a bonus, you get to better understand your learners’ thought processes – giving you a valuable insight into their view of the world. When should it be filled in, and by whom? Ideally it should be completed by the pupil at the end of a driving lesson. We say ‘ideally’ because sometimes the pupil won’t want to do it, and instead would rather the instructor took the notes. If an instructor is being truly client-centred, they will leave it up to the pupil to decide who writes it. It is most beneficial for the pupil to write the log themselves so that they don’t censor their thoughts and feelings. However, as long as the record is a true and honest reflection of the pupil’s thoughts and feelings, it shouldn’t matter too much who does the writing. Personally, I have found that most clients prefer me to take the notes whilst they are reflecting on the progress and expressing their thoughts verbally. I then summarise what they’ve said and enter it onto the log. This also saves lots of time. If I am doing the writing, I will still write the log in the first person, e.g, expressing the comments as “I”. I will also be careful not to alter the pupil’s terminology or wording. To make the biggest impact, it’s important that what is written on the log comes from them, with very little input from me, as their instructor. It is best if the reflective log is completed in-car, as you can ensure that it is completely thoroughly. Expecting a learner driver to go into their home, school, college or work and complete it usually results in them conveniently ‘forgetting’! Doesn’t it take too long to complete? Pupils want to be driving, not writing! I think it’s fair to say that most conscientious ADIs have been completing some form of lesson record at the end of each lesson for some time anyway, whether that be giving a score for each particular skill on the training record, or writing some notes on progress during that particular lesson. Yes it’s true that some ADIs choose to complete lesson records after the lesson is over and the pupil has gone, but for me personally, the end of session debrief is such an important and integral part of the lesson that ADIs shouldn’t feel obliged to exclude record completion from the lesson time. Make it a normal part of your lesson and your pupils will accept it. In every educational setting, lessons have a start (recap), middle (learning) and an end (recap/debrief), so why should driving lessons be any different? 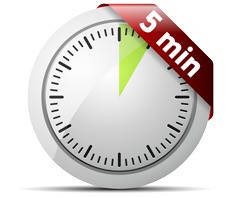 Completion of a reflective log will probably take no more than 5 minutes. My pupil is always itching to get out of the car at the end of the lesson. How can I maintain their attention? We’ve all been there – as soon as the pupil pulls up at their house, their hand is on the car door handle and they’re readying themselves to jump out! Their attention is on the missed text messages or phone calls on their mobile phone. They are mentally ‘elsewhere’ – certainly not in the right frame of mind to complete any paperwork. Fortunately, there’s a really easy solution to this problem. Pull up a couple of streets away from their drop-off point and complete the reflective log there. Their full attention is still likely to be on the lesson, as there’s still more driving to do! Therefore, you’re less likely to see them ‘switch off’. Once the log is complete, they can practise a bit of independent driving to their final destination. Where can I get one of these reflective logs? There are various options you could choose from. Some instructors supply each of their pupils with a ‘Starter Pack’ when they start lessons (which might include a branded pen, terms and conditions, Highway Code, referral vouchers, etc). Adding an inexpensive blank notepad to this pack, labelled ‘Reflective Learning Record’ is one idea. Who keeps the learning record is entirely up to you, although in my experience 17 year olds can be quite forgetful. If you intend to leave the learning record with your pupil, you’ll need a plan in place for when they forget it, or it gets ‘eaten by the dog’. The DVSA have conveniently supplied a sample reflective log in their ‘ADI1 Standard Operating Procedure’ (see page 77). You could print that off and maybe even develop your own, based around the headings used on the DVSA version. You could click here to download our version. 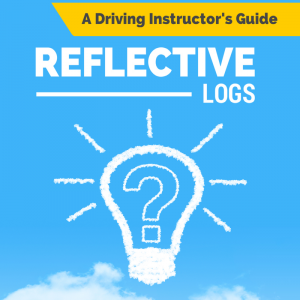 As I mentioned earlier, our reflective log is based on our previous ‘Student Lesson Record’ which has been publicly available for download on our www.activedrivingsolutions.com website for some time. It is double-sided and A4-sized to fit conveniently in a binder or plastic wallet, and you can record up to 6 driving lessons on each sheet. Simply print them out as you need them. 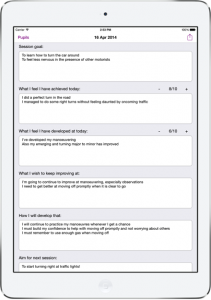 If you have access to an iPad, check out the ‘Robosoul Reflective Logs app’ designed by Neil Snow. It’s currently available for £2.49 on the iTunes App Store. Using the app has the added benefit of you being able to directly email completed logs to your students from within the app, keeping them up to date and enabling them to build a personal record of their progress. It can definitely be useful for you both to have a copy of the log. Will the examiner want to see my pupil’s reflective log on my Standards Check? If the ADI offers to supply training documents (such as the reflective log) you should discuss the content with them but if they do not bring such papers this will not invalidate the standards check. If you and your pupils do use reflective logs successfully, we would definitely recommend taking your pupil’s log into the test centre to show the examiner before the lesson commences. If you’ve read our industry contributions in the past, you’ll know how much emphasis we place on making a great first impression – it can definitely make a big difference to the examiner’s initial perception of your skills before they even get into the car. If you want to do well on your Standards Check, your aim should be to set a fantastic impression from the outset. 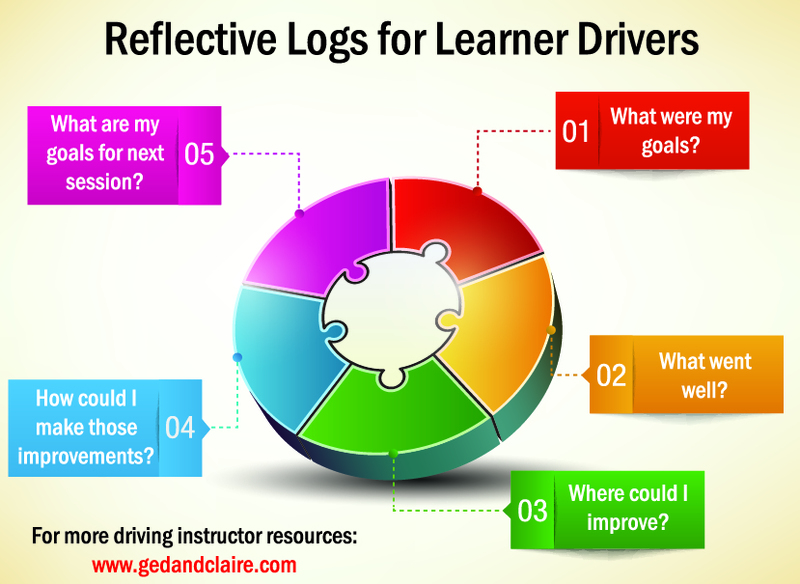 Do you use reflective logs with your pupils? What format have you found works best? Do you complete it, or do you encourage your pupil to do so? If you haven’t used reflective logs in the past, might you consider it? What other questions do you have that we haven’t answered? Please share your thoughts, questions and reflections in the comments below. 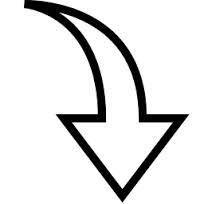 And remember, if you can think of someone that would benefit from this article on using reflective logs, please hit one of the buttons below and SHARE it! Follow Ged Wilmot on Google+! Since using Neil Snow’s reflective log app I have found it an essential tool to professionally conclude my driving lessons. It also paved the way to achieving my grade-A on my standards check back in Nov 2014. Just found your site. Excellent advice. how do i buy the book you have on offer i cannot find any links on your web page. ?